Are you tired of looking at your outdated bathroom? If so, then it's probably time for a renovation. For some inspiration, you might want to check out what the star of HGTV's Divine Design, Candice Olson, accomplished with one couple's dated space. Before the makeover happened, the bathroom was truly a blast from the nautical past. The blue toilet and the bathtub of the same shade did nothing to the space, and the bathroom vanity looked antiquated. Ample lighting came from the big window but the blue lighting fixture ruined the natural illumination of the room. For a complete design intervention, Olsen gutted the bathroom and replaced the pieces with brand new pieces that evoked a tranquil spa-like atmosphere. 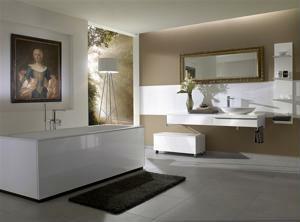 A brand new white bathtub replaced the old clunker, but it was placed vertically to make more use of the room. The extra space created allowed the designer to install a brand new steam shower with a rain showerhead for everyone's enjoyment. Additionally, a new contemporary vanity with wood drawers replaced the old piece, creating an inviting and cozy space.